Singer Djinee who was in a fatal accident recently has appealed to all his fans and admirers to continue to pray for him as he recuperates from the near-death experience. The music star made his appeal known via his Instagram page, where he shared a photo of himself getting scanned for an undisclosed reason. He, however, went on to thank God for sparing his life as he revealed that this was his closest shave to death in all car accidents he has gotten involved in. 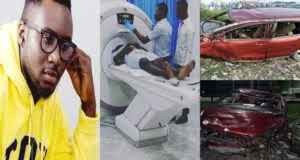 “Having been through quite a few near-death situations, this horrific car accident has to rank as the closest! To say my survival is a miracle will be putting it mildly. It is God’s show of grace and mercy! He put me to sleep through it all so there were no maneuvers, no James Bond stunts.. nothing! I literally slept and woke up in the hospital. I want to sincerely thank you for your prayers, and concern. I also want to apologize for being unavailable; the doctor advised that I receive/make fewer visits and calls.